Gochujang is an old Korean condiment. As such, it is used with dishes such as bibimbap, dukbokki and many kinds of jjigae. 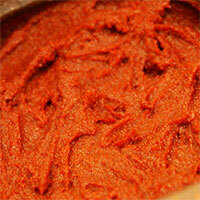 Gochujang can be described as red paste with spicy (and a bit sweet) flavor. Its red color and spicy taste comes from red chilli pepper, mixed with glutinous rice and soybean paste. The mixture has to be left outdoors in pots or jars to age under the sun. Once prepared, it can be used with various soups and stews, and even for marinating meat. Some of less common uses for this paste is like a dip for vegetables or potato chips. Gochujang, by composition, is thick but doesn't contain many calories. The calories in Gochujang per 18g(1 Tbsp) is 46 calories. Gochujang is calculated to be 256Cal per 100 grams making 80Cal equivalent to 31.25g with 9.09g of mostly carbohydrates、1.39g of protein、0.63g of fat in 18g while being rich in vitamins and minerals such as Molybdenum and Vitamin E Alpha Tocopherol.